I really like that thing in the upper left corner with its mouth open. It kind of looks like a shark, bull and dog all rolled into one. 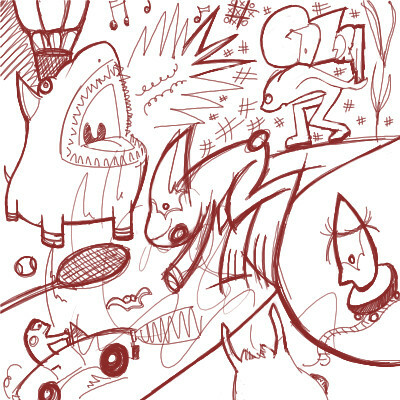 I spy with my little brown eye a hot air balloon, a tennis ball and racket, a guy driving a car, the back of a dogs head, a pig making a loud oink, a rabbit-frog, a clown in a train, a weed, a guy holding up some words, three musical notes, 18 number symbols, and a deformed bat. I like the car guy. it looks like tee shirt Design noice.